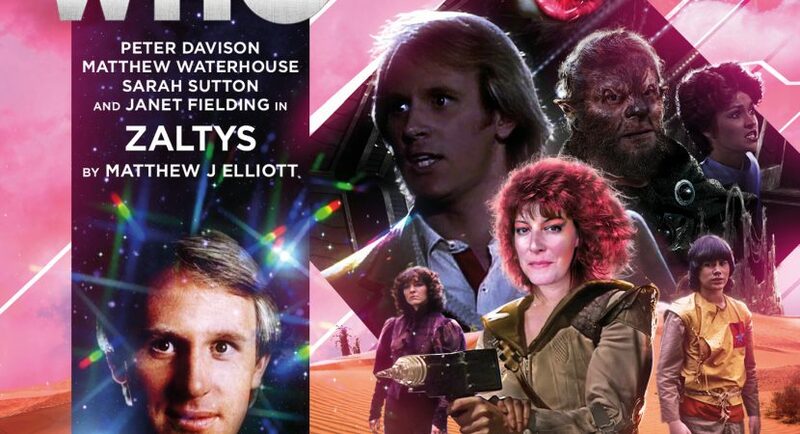 The Doctor has misplaced his companions once again, and he and Nyssa must swoop to the rescue while Tegan and Adric struggle to stay one step ahead of the monsters and aliens hunting them. Their survival may depend on whether they can tell which is which. This is a creative mishmash of a story which boils down to “Can the crew find one another before they’re killed?” After all, there’s so many different people trying to kill them, for so many different reasons! Nevertheless, when they first arrive on Zaltys, they find the planet eerily deserted, under mysterious and possibly contagious circumstances. While looking for their friends or any sign of the natives, the Doctor and Nyssa run afoul of a ruthless Scavenger (professional looter) whose wry quips and sarcastic asides are more entertaining for listeners than for the characters she’s pointing a gun at. Notwithstanding the Radio Times‘ article on Rebecca Root making her Doctor Who debut (a friend of mine lamented that of course the first trans actor in Who would be cast as an alien), director Barnaby Edwards describes Sable the Scavenger as “our human guest star, as it were.” In fact, apart from Tegan, all the other characters are aliens: Time Lord, Trakenite, Alzarian, Amphisbene (fishoid), werewolf, the odd xenophobe, and some very old enemies of the Doctor’s. (As Peter Davison remarked in Eldrad Must Live’s interviews, he frequently mops up after his predecessors.) All great voices, especially Niamh Cusack as Clarimonde, whose coquettishly sadistic mannerisms occasionally put me in mind of an Irish Missy. Clarimonde toys with Tegan in a deadly and horrific game of cat-and-mouse, but Tegan is nobody’s pawn and won’t give in to fear or despair. Meanwhile, the Doctor and Nyssa discover that the Zaltys is facing a planetwide catastrophe, and they may suffer the same fate as the inhabitants if they can’t rescue their friends and escape immediately. On the one hand, this is one of those stories where the Doctor is eclipsed by all his companions and so many strong guest characters. On the other hand, the entire TARDIS team gets to use their strengths: Tegan’s resourcefulness and outspoken defiance, Adric’s math and computer smarts, and Nyssa’s technological skills and not-yet-realised mental abilities (which only began to manifest in Time Flight). I wish I could be more specific without spoilers. All I can say is that it’s very character-driven, and that certain covert schemes keepthe Doctor guessing nearly until the end. There’s even some subtle foreshadowing of things to come (sorry, Adric). I keep waffling on how to rate this, because the plot didn’t leap out and grab me, yet I really enjoyed the characters and dialogue. I’ve had to listen to it again since it came out to refresh my memory, and I think I’ve finally decided the latter outweighs the former. It’s such a good story that I only realised after discussing it with a friend: the Doctor plans to save everyone by sacrificing himself, but one again someone else winds up doing it in his stead. So he spends the end of the story wringing his hands and begging Gevaudan not to kill Nyssa. It’s moving, but still, I wish the Doctor had been able to confront Clarimonde himself, rather than everyone else doing it for him. Then again, Nyssa hadn’t gotten to do much by that time except pretend to sprain her ankle (in-joke!) in order to trick Sable. And the Doctor had already accomplished the important task of unmasking the real villain, Perrault, after initially suspecting the wrong person. Gevaudan was an appealing character, all the moreso since he was set up to be ambiguous. Also, while it doesn’t matter in the grand scheme of things, I appreciated that he happened to be gay.